The best way for me to keep embroidery project supplies together is by keeping them in a bag or basket. Bags are especially good if you want to take your project with you. I made quite a few drawstring bags (and received some too!) over the years. Generally they are quick and easy to make and you can find lots of tutorials online. I recently made a new, lined drawstring bag from a tutorial by Jeni Baker of In Color Order. A perfect project for the cute Owl & Pussycat fabric I had in my stash. 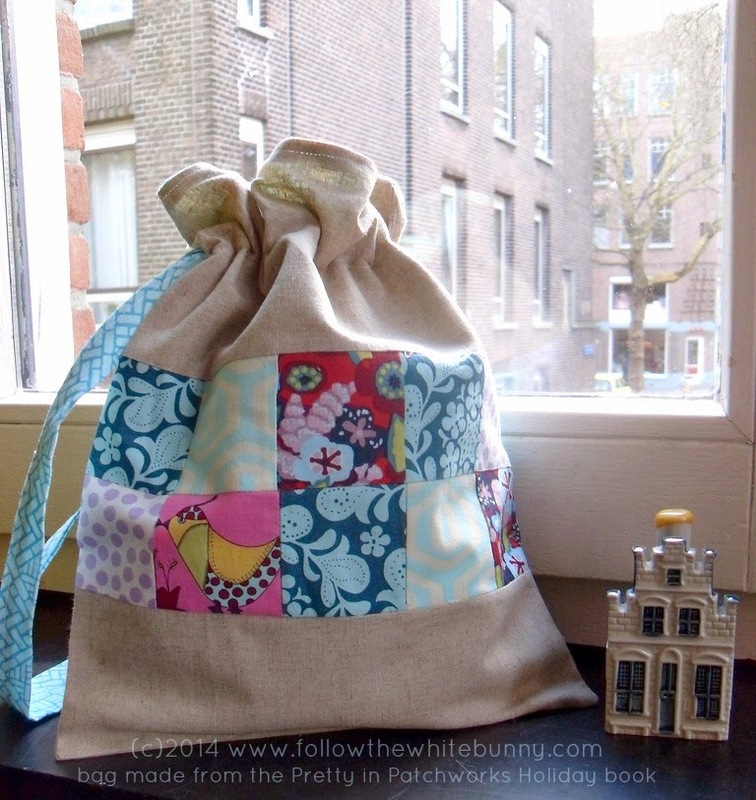 Jeni's tutorial was very easy to follow and I love that the bag has a 'boxy' bottom. I like bags with boxy bottoms. :) My bag can hold smaller projects but if you are looking to make a larger version you can buy a pattern with various sizes. A few other drawstring bag tutorials. There's one from the Purl Bee Blog and another really easy one by Amy Smart. 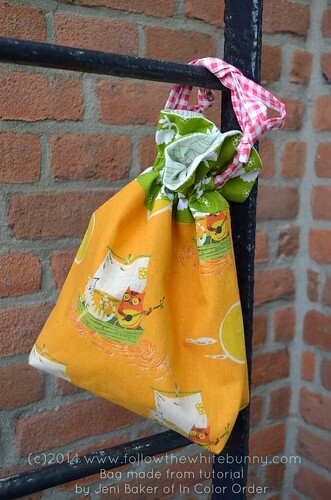 And if you like a scrappy patchwork bag then be sure to check out this tutorial by Ayumi of the Pink Penguin blog. A couple of years ago I made this drawstring bag for a swap. It's from the Pretty in Patchwork Holidays book but you can find this particular tutorial by John Adams for free on Sew Mama Sew. Do you have a favourite sewing tutorial or pattern for craft bags, caddies or other craft storage solutions? I'd love to know!